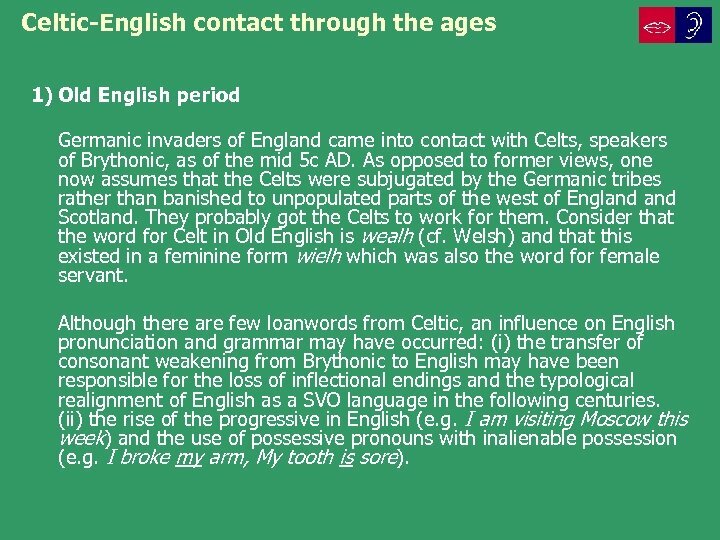 Celtic-English contact through the ages 1) Old English period Germanic invaders of England came into contact with Celts, speakers of Brythonic, as of the mid 5 c AD. 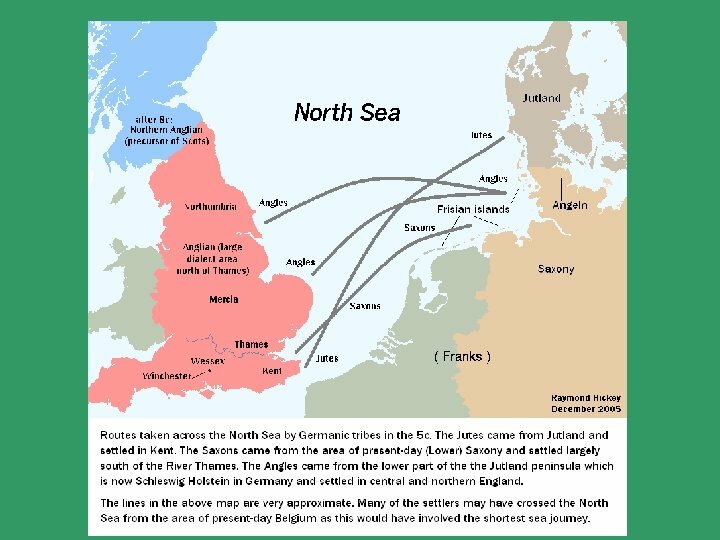 As opposed to former views, one now assumes that the Celts were subjugated by the Germanic tribes rather than banished to unpopulated parts of the west of England Scotland. They probably got the Celts to work for them. Consider that the word for Celt in Old English is wealh (cf. Welsh) and that this existed in a feminine form wielh which was also the word for female servant. Although there are few loanwords from Celtic, an influence on English pronunciation and grammar may have occurred: (i) the transfer of consonant weakening from Brythonic to English may have been responsible for the loss of inflectional endings and the typological realignment of English as a SVO language in the following centuries. (ii) the rise of the progressive in English (e. g. I am visiting Moscow this week) and the use of possessive pronouns with inalienable possession (e. g. I broke my arm, My tooth is sore). 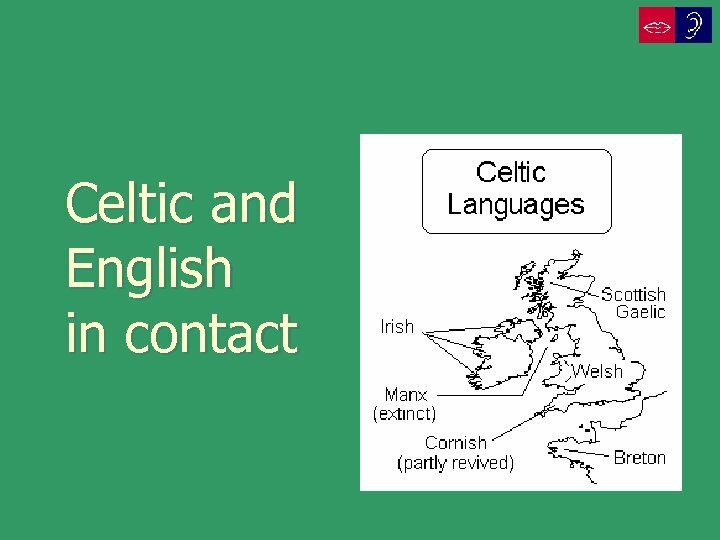 Celtic-English contact through the ages 2) Early Modern period The spread of English throughout the British Isles led in later centuries to a gradual shift from Celtic to English on the part of speakers in the Celtic regions, specifically in Wales, Scotland Ireland. 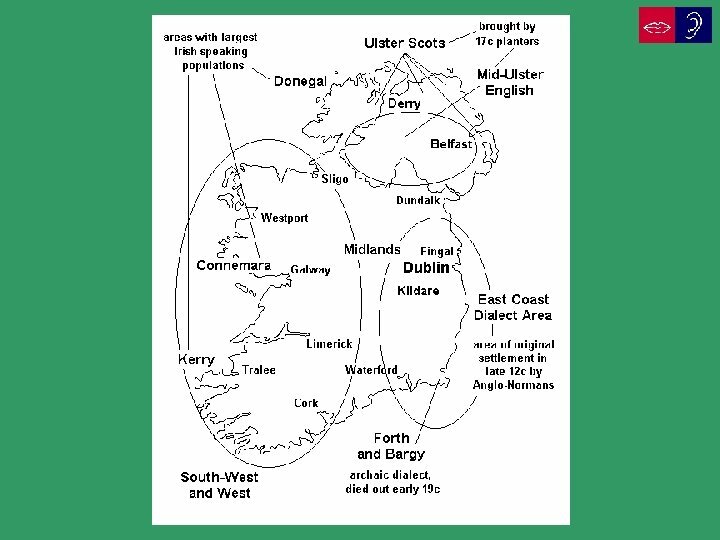 The language shift which took place caused the transfer of many structures from the Celtic languages to the varieties of English which emerged in these regions. This is especially true of English in Ireland in western, northern Scotland including the islands off the northwest coast of this country. As with the earlier period, the main linguistic levels affected were phonology and syntax. This is typical of language transfer from a substrate language (in this case Irish and Scottish Gaelic) to a superstrate language (in this case English). 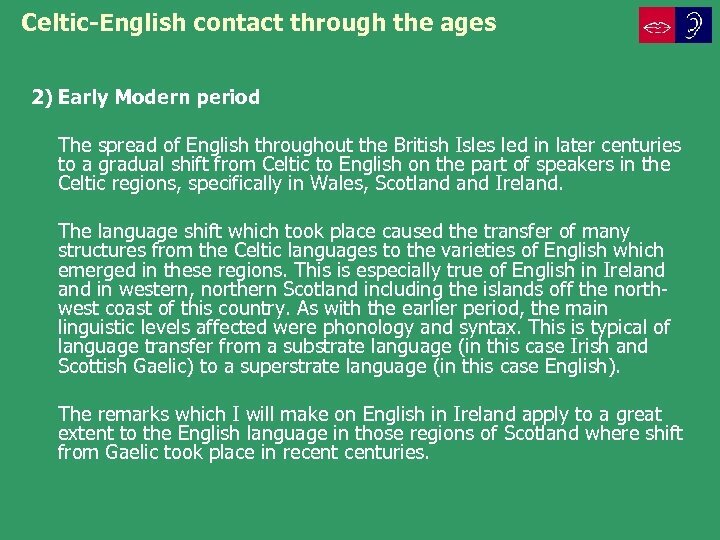 The remarks which I will make on English in Ireland apply to a great extent to the English language in those regions of Scotland where shift from Gaelic took place in recenturies. 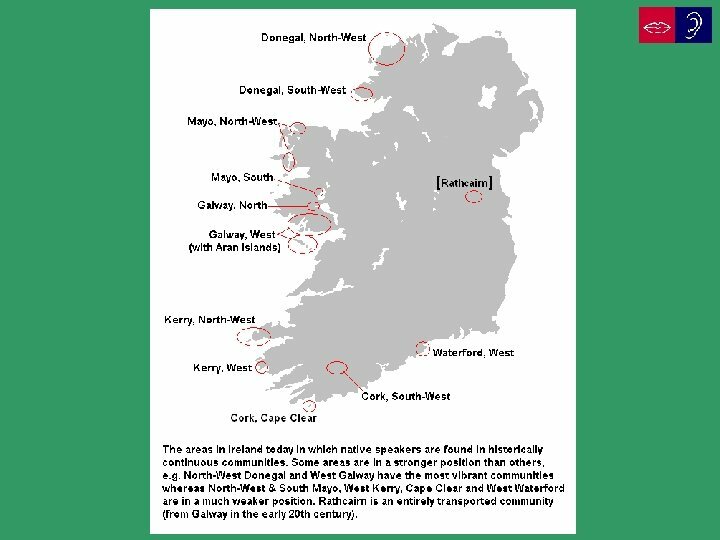 Periods in the development of Irish English 1) First period Late 12 th century to 1600 Establishment of English on the east coast in a band from Dublin down to Waterford. English is above all present in the towns; Anglo-Norman — and of course Irish — in the countryside. Increasing Gaelicisation in the centuries after the initial invasion led to the demise of English outside the major towns. The low point for English is reached in the 16 th century with Irish in a correspondingly strong position. 2) Second period 1600 to present-day This begins with a decisive military defeat for the Irish. The north of the country is particularly affected with settlers from Lowland Scotland moving to Ulster and establishing a firm presence there. Later on in the 17 th century there are vigorous plantations of the south of the country (under Cromwell). 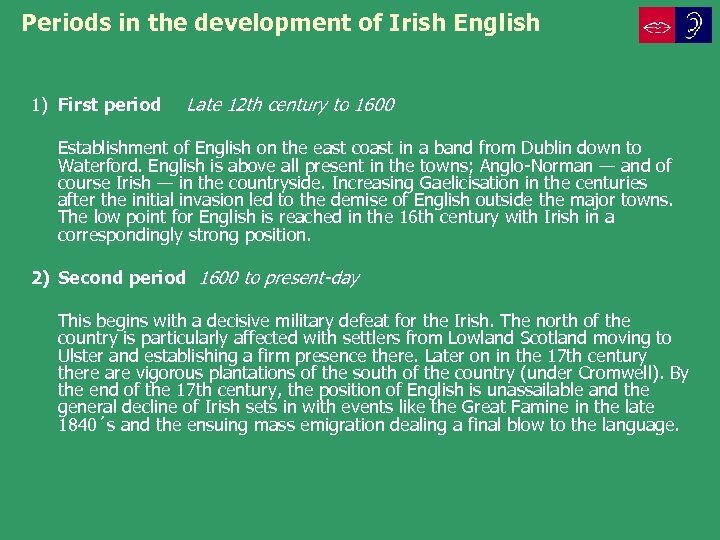 By the end of the 17 th century, the position of English is unassailable and the general decline of Irish sets in with events like the Great Famine in the late 1840´s and the ensuing mass emigration dealing a final blow to the language. The English language in Ireland After the accession of James VI of Scotland as James I to the English throne a vigorous policy of plantation was pursued in Ulster, filling the geographical and political vacuum left by the defeated Irish with settlers from Lowland Scotland also from other parts of Britain, mainly northern Britain. These settlers are the ancestors of the current Protestant population in Northern Ireland. 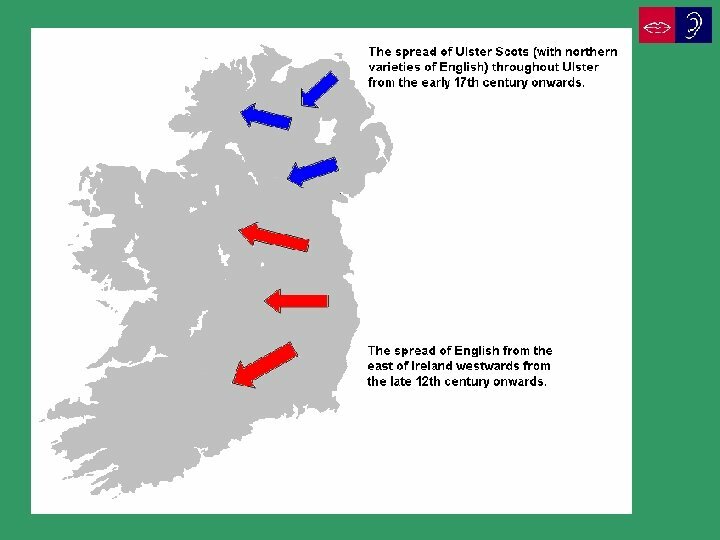 The two new groups in 17 th century Ulster led to a linguistic landscape in which Ulster Scots on the rim of the province and Mid-Ulster English further inland became the dominant varieties of English. Ulster Scots has retained its specific profile to this day and has been strengthened by official recognition in the European Charter for Regional or Minority Languages (1992) which was adopted by the government of the United Kingdom in 2001. 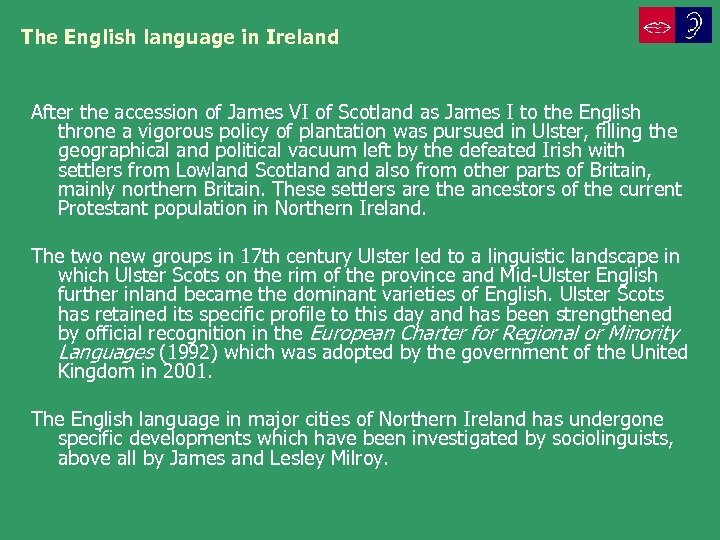 The English language in major cities of Northern Ireland has undergone specific developments which have been investigated by sociolinguists, above all by James and Lesley Milroy. 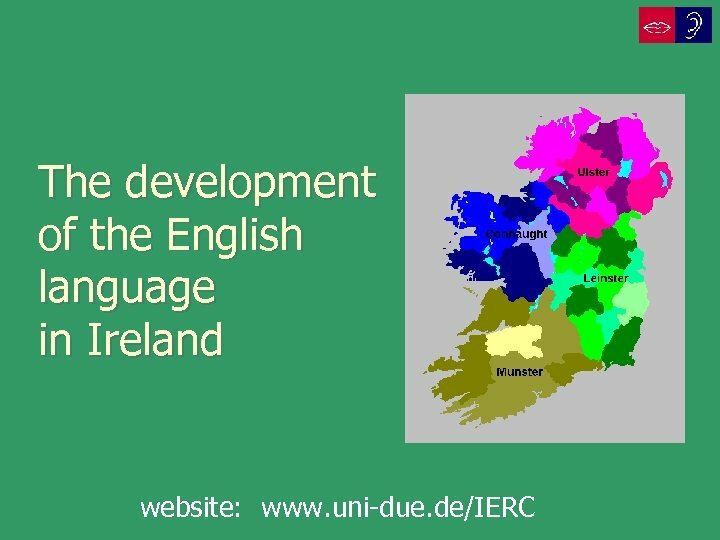 The English language in Ireland In the south of Ireland the development of English was characterised by the major language shift which took place approximately between the early 17 th and late 19 th century. 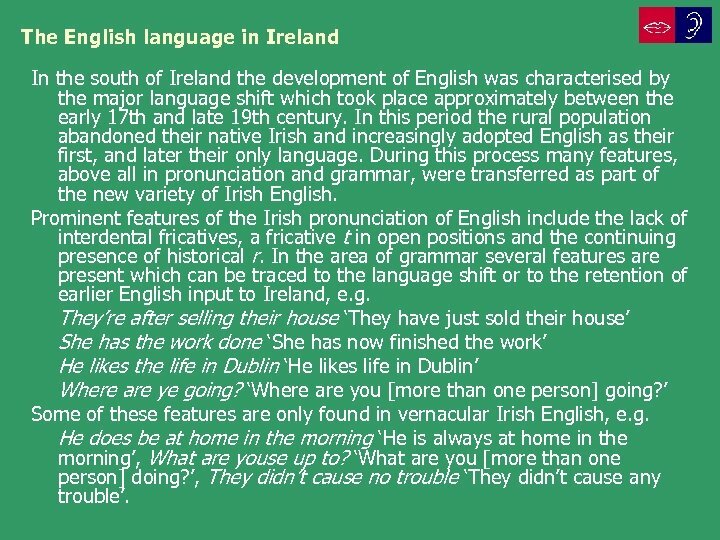 In this period the rural population abandoned their native Irish and increasingly adopted English as their first, and later their only language. 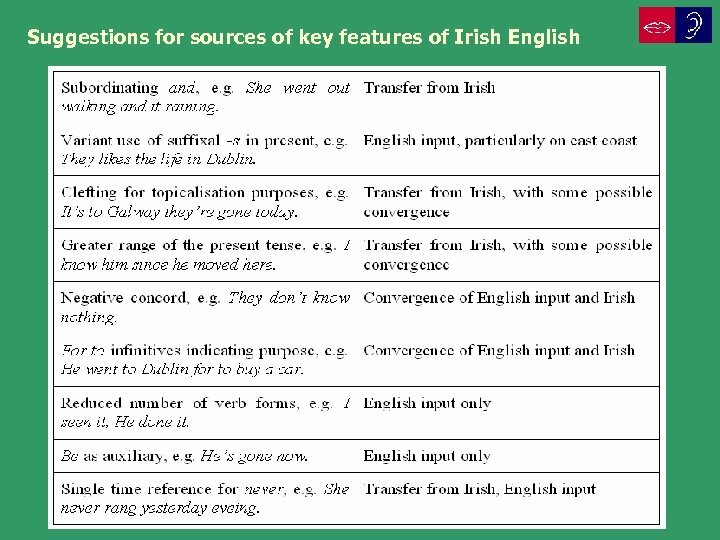 During this process many features, above all in pronunciation and grammar, were transferred as part of the new variety of Irish English. 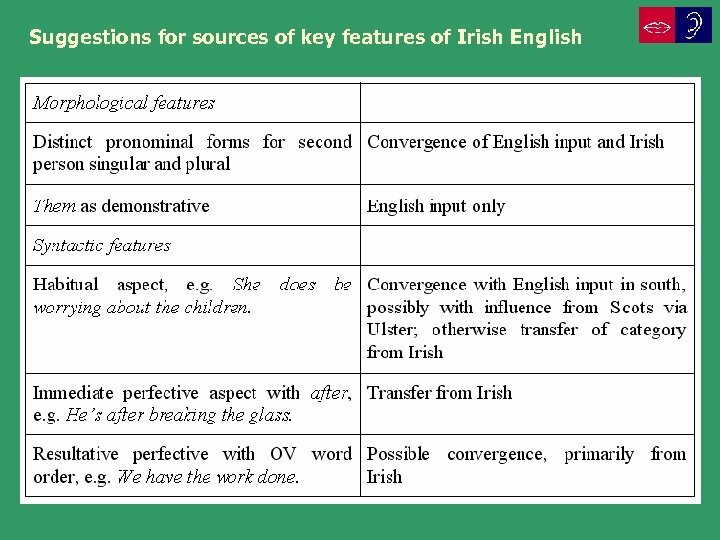 Prominent features of the Irish pronunciation of English include the lack of interdental fricatives, a fricative t in open positions and the continuing presence of historical r. In the area of grammar several features are present which can be traced to the language shift or to the retention of earlier English input to Ireland, e. g. They’re after selling their house ‘They have just sold their house’ She has the work done ‘She has now finished the work’ He likes the life in Dublin ‘He likes life in Dublin’ Where are ye going? ‘Where are you [more than one person] going? 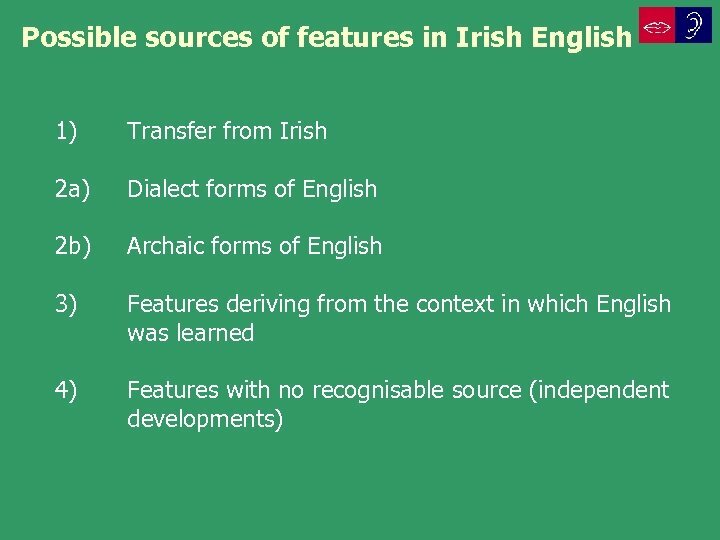 ’ Some of these features are only found in vernacular Irish English, e. g. He does be at home in the morning ‘He is always at home in the morning’, What are youse up to? ‘What are you [more than one person] doing? ’, They didn’t cause no trouble ‘They didn’t cause any trouble’. 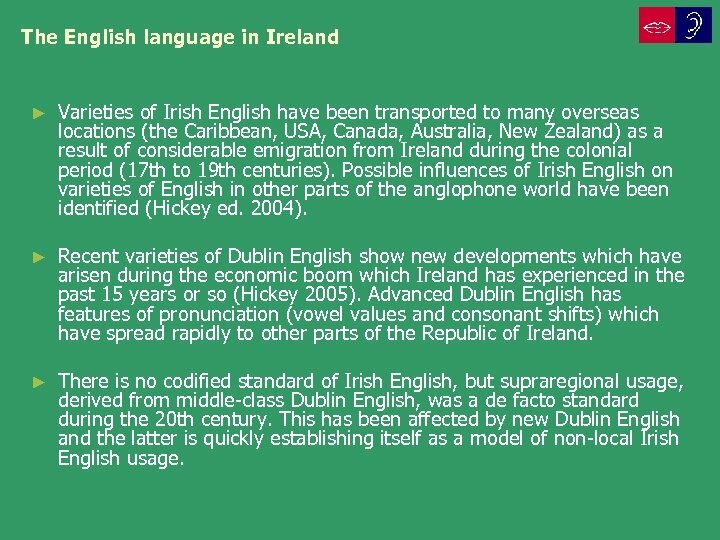 The English language in Ireland ► Varieties of Irish English have been transported to many overseas locations (the Caribbean, USA, Canada, Australia, New Zealand) as a result of considerable emigration from Ireland during the colonial period (17 th to 19 th centuries). 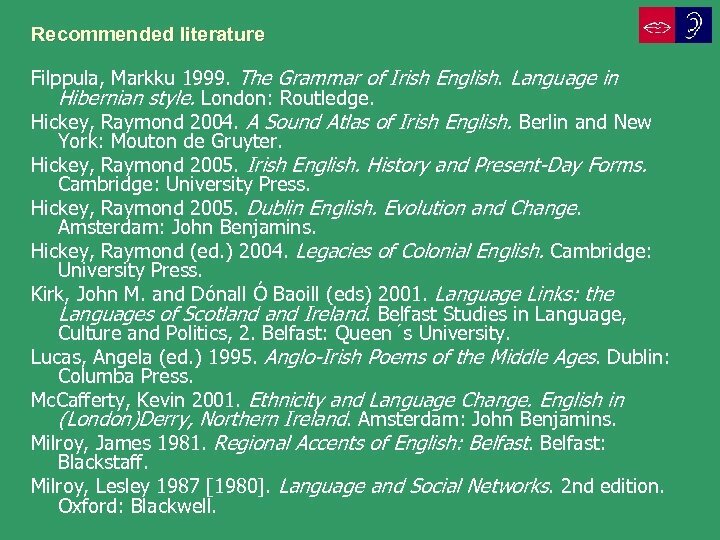 Possible influences of Irish English on varieties of English in other parts of the anglophone world have been identified (Hickey ed. 2004). ► Recent varieties of Dublin English show new developments which have arisen during the economic boom which Ireland has experienced in the past 15 years or so (Hickey 2005). Advanced Dublin English has features of pronunciation (vowel values and consonant shifts) which have spread rapidly to other parts of the Republic of Ireland. ► There is no codified standard of Irish English, but supraregional usage, derived from middle-class Dublin English, was a de facto standard during the 20 th century. This has been affected by new Dublin English and the latter is quickly establishing itself as a model of non-local Irish English usage. 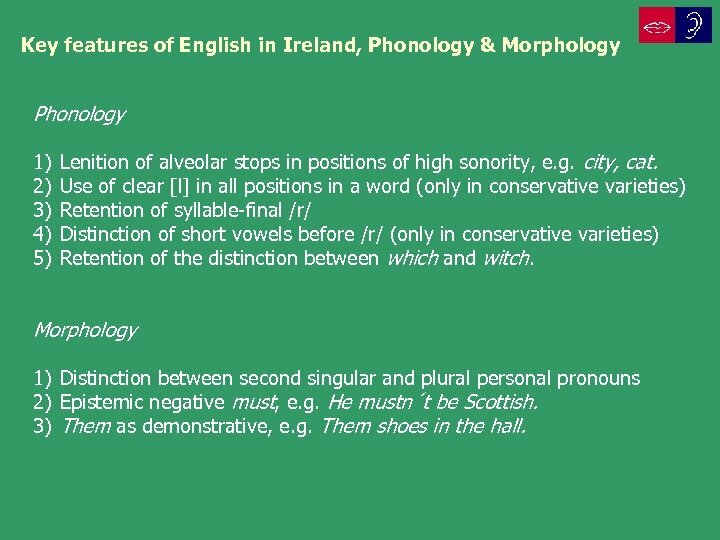 Key features of English in Ireland, Phonology & Morphology Phonology 1) 2) 3) 4) 5) Lenition of alveolar stops in positions of high sonority, e. g. city, cat. Use of clear [l] in all positions in a word (only in conservative varieties) Retention of syllable-final /r/ Distinction of short vowels before /r/ (only in conservative varieties) Retention of the distinction between which and witch. Morphology 1) Distinction between second singular and plural personal pronouns 2) Epistemic negative must, e. g. He mustn´t be Scottish. 3) Them as demonstrative, e. g. Them shoes in the hall. 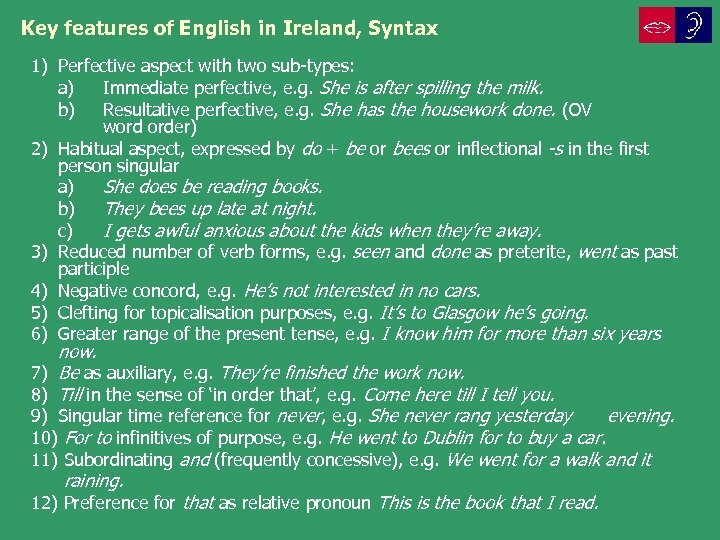 Key features of English in Ireland, Syntax 1) Perfective aspect with two sub-types: a) Immediate perfective, e. g. She is after spilling the milk. b) Resultative perfective, e. g. She has the housework done. (OV word order) 2) Habitual aspect, expressed by do + be or bees or inflectional -s in the first person singular a) She does be reading books. b) They bees up late at night. c) I gets awful anxious about the kids when they’re away. 3) Reduced number of verb forms, e. g. seen and done as preterite, went as past participle 4) Negative concord, e. g. He’s not interested in no cars. 5) Clefting for topicalisation purposes, e. g. It’s to Glasgow he’s going. 6) Greater range of the present tense, e. g. I know him for more than six years now. 7) Be as auxiliary, e. g. They’re finished the work now. 8) Till in the sense of ‘in order that’, e. g. Come here till I tell you. 9) Singular time reference for never, e. g. She never rang yesterday evening. 10) For to infinitives of purpose, e. g. He went to Dublin for to buy a car. 11) Subordinating and (frequently concessive), e. g. We went for a walk and it raining. 12) Preference for that as relative pronoun This is the book that I read. Recommended literature Filppula, Markku 1999. The Grammar of Irish English. Language in Hibernian style. London: Routledge. Hickey, Raymond 2004. A Sound Atlas of Irish English. Berlin and New York: Mouton de Gruyter. Hickey, Raymond 2005. Irish English. History and Present-Day Forms. Cambridge: University Press. Hickey, Raymond 2005. Dublin English. Evolution and Change. Amsterdam: John Benjamins. Hickey, Raymond (ed. ) 2004. Legacies of Colonial English. Cambridge: University Press. Kirk, John M. and Dónall Ó Baoill (eds) 2001. Language Links: the Languages of Scotland Ireland. Belfast Studies in Language, Culture and Politics, 2. Belfast: Queen´s University. Lucas, Angela (ed. ) 1995. Anglo-Irish Poems of the Middle Ages. Dublin: Columba Press. Mc. Cafferty, Kevin 2001. Ethnicity and Language Change. English in (London)Derry, Northern Ireland. Amsterdam: John Benjamins. Milroy, James 1981. Regional Accents of English: Belfast: Blackstaff. Milroy, Lesley 1987 . Language and Social Networks. 2 nd edition. Oxford: Blackwell.